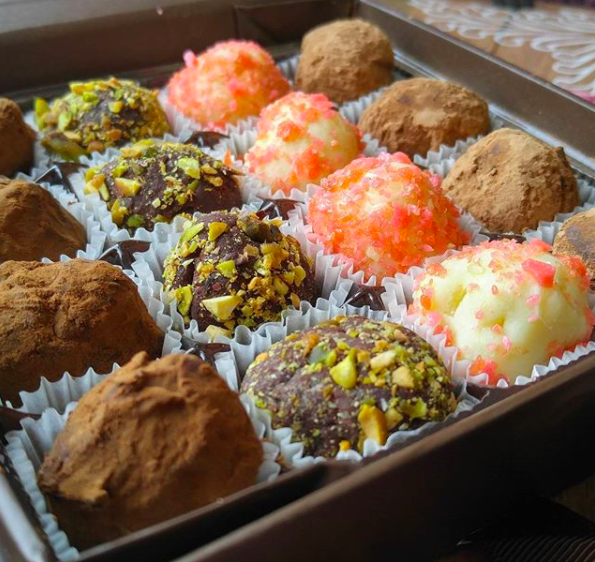 February is the Month of Love and of Free Truffles for Life! Groundhog's Day, Presidents' Day, and some other holiday that I can't quite remember all become a blur in February and it feels like the holidays are easy to miss. But, don't worry friends! What you haven't missed out on is your chance for FREE TRUFFLES FOR LIFE! There are still spots available for additional micro-investors, including one remaining spot open on the plaque of our first ten investors! Love is love. Love of chocolate, doubly so. Valentine's Day is coming and we want to help you express your unapologetic love. Our Valentine's Day Truffle Package is a curated collection of exquisite truffle flavors. For the Classic box: Lavender Menace, Pistachio Rose Water, Champagne with Popping Candy, and Burnt Caramel w/ Sea Salt. For the Vegan box: Lavender Menace, Pistachio Rose Water, Vanilla Porter, and Burnt Caramel w/ Sea Salt. Our Valentine's Day Truffle Package will be available for the entire month of February! Queer Chocolatier is proud to present Raspberry Balsamic Vinegar Truffles for the Month of Love. Skip the chocolate covered cherries and grab a box of these beauties instead! Subscribers have a personalized page to make quick selections of flavors, mailing instructions, and track their shipments! Truffle Assortment Packs now allow for a blend of Classic and Vegan truffles in each pack. Choose 3 Classic and 3 Vegan, 5 Classic and 1 Vegan, all is possible now! Free Shipping for orders over $45! More work will continue on the website, including some upcoming changes for Queerious: The Queer Chocolatier Blog. There is a serious choco-panic afoot and it is due to an equally serious misunderstanding (or misrepresentation) of scientific studies around the growing and genetic modification of cacao trees. I'd even mentioned in the last newsletter about the hype of climate change making chocolate taste better (it won't), but more recent than that is the current viral story of the impending extinction of cacao trees and, thereby, the end of chocolate as we know it. Don't worry. Queer Chocolatier's here. There are some good pieces (this one and this one) that help debunk the clickbaitey stories. The problem with such "journalism" is that there are, in fact, very concerning issues regarding the growing, production, and processing of cacao into chocolate throughout the whole supply chain, but the genuine problems get erased when there are so many chocolatey crying for wolf pieces that get it wrong and experts untangle the facts from fiction, by then the public's attention is gone onto something else. Tl;dr: Chocolate will not disappear from the earth in 40-50 years. It may change or become more expensive, but it will still be here. And neither of those possibilities--change or expense--are inherently bad. Stay tuned as I share more in future blog posts to expand on our cocoa future. Daniela Vega as Marina in A Fantastic Woman. On my I-must-watch-this-very-very-soon list is the Chilean movie, A Fantastic Woman, where Daniela Vega portrays a women who experiences discrimination and violence by families and institutions in greater measure once her middle-aged boyfriend dies. This Slate interview whets your appetite to watch the movie while also showing the necessity of having trans* stories played out by trans* actors who are infinitely more capable and talented at telling their stories with their own voices more than any cisgender actor could ever do. An excellent complementary piece to go along our current Queer Chocolatier Book Club book (Redneck, Queers, and Country Music), this Rewire article is a much-needed discussion about parenting while queer in rural places such as Appalachia. The author shares his use of the word "Baba" as a parental identity instead of "Mama" or "Dada," and highlights a point I didn't know: the term "Baba" means "dad" in some languages while meaning "grandma" in others. What a beautiful word to use, then! From the article: "But the hardest thing about queer parenting has been helping my own son, now 2-and-a-half years old, navigate a culture that places supreme value on mommies and daddies and makes anything else, like babas, like me, invisible." Be careful while reading this. I teared up a bit towards the end. In Venezuela, the home of Chocolates El Rey and the source chocolate for my confections, cacao and chocolate can be an economic lifeline for individuals, including many women. From the article: "Like some 20 recently launched Venezuelan businesses, [nutrition professor Nancy] Silva uses the country’s aromatic cocoa to make gourmet bars of the kind that can fetch more than $10 each in upscale shops in Paris or Tokyo." She is later quoted as saying “Our real oil is cocoa,” referring to the notoriety of Venezuela as an oil-rich nation while less well-known as a region for producing some of the most prized cacao beans grown around the globe. Bean-to-bar chocolate makers in Venezuela have more control over their products and can command a higher price for their products, but the government bureaucracy can be the biggest challenge. Furthermore, some companies in the United States will advertise their bars as having Venezuelan beans, but are generally cut with other, lower-quality beans in the same way that a Kona coffee bean blend will dilute the prized bean with inferior beans. In order for the Venezuelan chocolate makers and chocolatiers to continue to command greater market value and increase market share is to take command of their own distribution. I salute them in their journey. Just so you know, I have never not once been to Germany.